An exhibition of original, artist-produced vinyl records. Actual Size Los Angeles is pleased to announce Vinyl Mandala, a group exhibition curated by Justin Cole. 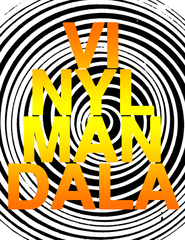 Vinyl Mandala highlights Los Angeles based artists and collectives who utilize the album as a medium. Limited run records with hand-made graphic elements provide a visual and tactile addition to the listening experience. A selection of unique vinyl records will be on display and available for listening. For the opening reception, Actual Size will host an evening of live performance and DJ sets. Vinyl Mandala features work by Akiko and Hashim Bharoocha, Alex Klein, Brian Roettinger, dublab, Eamon Ore-Giron, Golden Hits, HIT + RUN, Julio Cesar Morales, Lucky Dragons, OJO, Teebs, and The Collapsible Mammals. On December 11th, from 7-9pm DJ Hashim B. and Ned Learner will spin selections from the exhibited albums. From 9pm until midnight, the gallery will host live performances by Lucky Dragons, OJO, and Golden Hits. Dress warmly, as portions of the performance are outdoors. During gallery hours on December 18-19th, visitors are invited to listen to the records on display in an informal listening lab. Gallery hours are Saturday and Sunday from 12-5pm; weekdays by appointment only. All records will be available for sale in limited editions. Justin Cole was born in Detroit, MI in 1981. He is represented by Pepin Moore. Cole’s work was recently featured in a solo exhibition, Historical Impulse in November 2010. He is a member of the collective OJO. Gallery Hours: Sat- Sun 12:00-5:00pm; Weekdays by Appointment.